1. Breguet 690, Swedish version was to be 694, designation S 10, S stands for the Swedish word Spaning which means Reconnaissance. The order for 12 Machines was placed in June 1938 and delivery was planed to start in April 1939. The production was delayed and when war broke out the French government canceled the Swedish contract. The swedish adaptation workers who had been busy installing swedish equipment had to remove all their work and return to Sweden. S 10, 2nd Division F 3 Wing in French colors and Swedish markings according to 1938 order. Insignia in 6 places 800 mm on sides and wing top, 1500 mm on underside of wing, Wing number, 3, Always on the left side of side insignia and individual number,21 , to the right of the insignia, both numbers in black and 400mm high. Since the plan was to outfit the 2nd division with S10 the Aircrafts would have been numbered from 16 to 30, or rather since Sweden only ordered 12, from 16 to 27. Since the Swedish had first studied the Dornier Do 17, the Dornier Flugzeugwerke had developed a updated variant specifically for long range reconnaissance; the Dornier Do 217A-1. Upgraded with inline DB 601Aa engines but downgraded with nonsealing fuel tanks. Sweden, Greece, Bulgaria, Schweiz, Holland and Yuogoslavia shoved interest and the first order for 50 Machines with BMW 132 or Bramo 323 engines was placed by Yugoslavia on the 4th of July 1939. 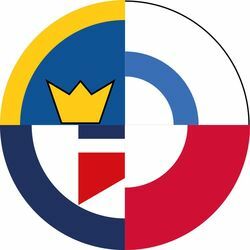 Romania’s order for 30 Aircraft and a expected Dutch order for 18 was both accepted by the Reich Luftfartministerium on the 4th of November 1939. Dornier was instructed to use 55 series Dornier Do 17Z for the production. 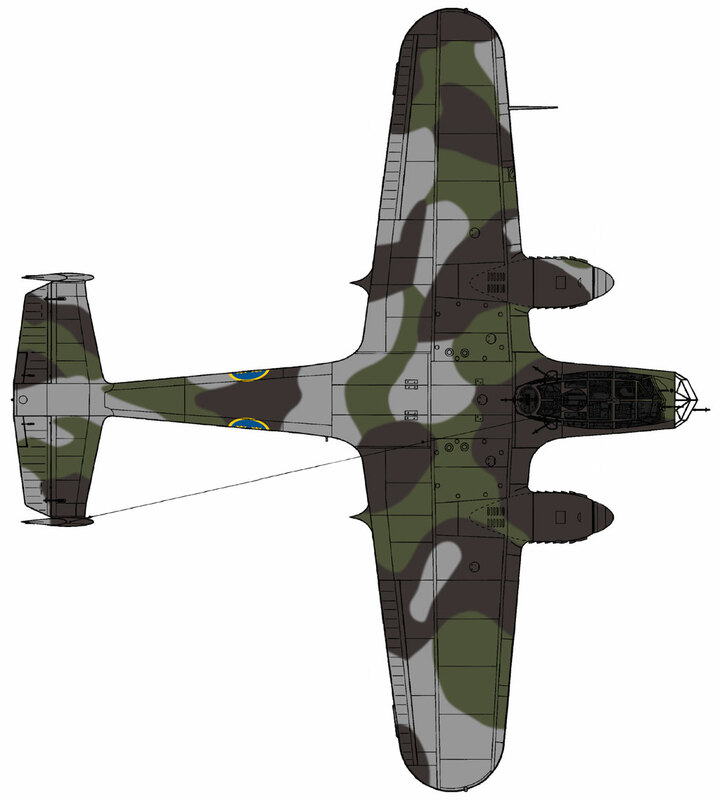 Sweden placed an order for 18 Do 215 on the 30th of December 1939. Deliveries of the Swedish machines was to start with three AC in May 1940, four in June, four in July and one in August. The last six machines would not be delivered until Mars and April of 1941. After ordering Six DB 601Aa engines and spares for 44 engines directly from Daimler Benz AG and sending Swedish compasses to Dornier for aircraft adaptation Sweden was told in July 1940 that no aircraft would be delivered. Of all the Do 215 orders only two where sold to the Soviet Union! Two aircraft with simplified equipment was delivered in April of 1940. Luftwaffe took delivery of 98 Do 215B-4 and B-5. S 11, 4th Division F3 Wing Aircraft in German export colors of RLM 61, 62, 63 and 65. Markings according to 1940 Order: Insignia with yellow border in 4 places, 960 mm on sides and 1800 mm on wings. Markings on wing top was omitted. 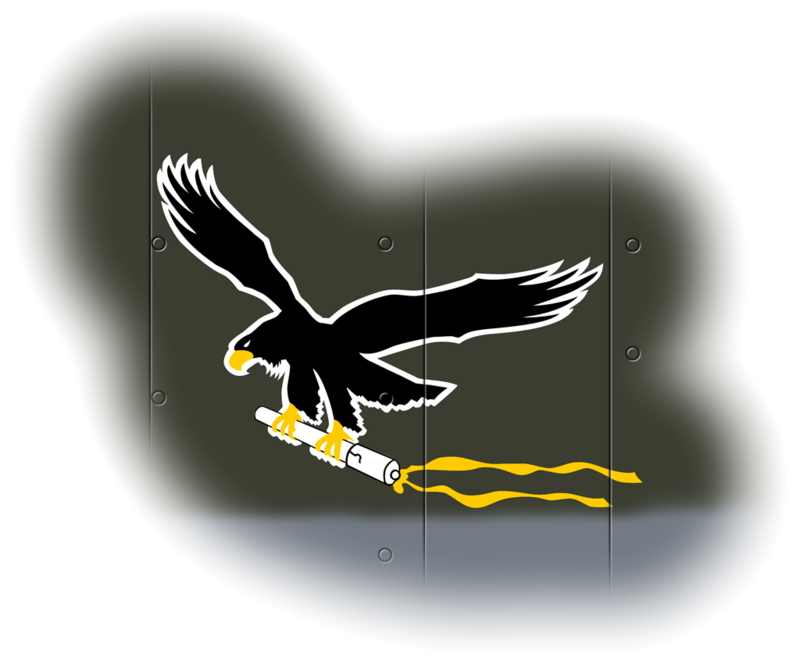 Wing number in 400 mm high on the left hand side of insignia. White aircraft number in 1000 mm on tail and 800 mm on nose. S 11, 4th Division F11 Wing 1948 Markings according to December 1944 order: Swedish colors 058 Light Blue Gray and 338 Dark Gray Green. Insignia in six places 960 mm on side and 1800 mm under and over side of wing. Wing number in yellow 400 mm numbers BEHIND insignia. Aircraft number in yellow 1000 mm and 800 mm high numbers on tail and nose. Spinner in green for fourth squadron (division in Swedish). The Aircraft has an AN/APS-4 radar for maritime surveillance. Since the S 11 is not an Fighter or Attack aircraft it would not use the system of colored letters on tail and nose but numbers. The letters were colored in division color, red=1st, blue=2nd, yellow=3rd, green=4th and Black or white for staff, outlined in white. When the Fokker G.1 was evaluated concerns about the restricted view for the observer had placed the aircraft lower on the Swedish ”wish-list” for a reconnaissance plane. But an air force does not live on intelligence alone! The Swedish Heavy Bomber, B 3 (actually Junkers Ju 86K!) was being produced under license by SAAB but it was clear that the design was outdated and that Sweden needed a more modern bomber and that resources was wasted on B 3 production. SAAB terminated the B 3 in February of 1940 and concentrated on the dive bomber B 5 (Northrop A-17). During the evaluation of the Fokker Captain Björn Bjuggren tested the dive bombing capability and and reported favourably, the Fokker G.1A was regarded as a possible interim solution untill the Swedish two-engined dive bomber P 8 would be ready. With the B 3 terminated and the P 8 a long way of (it would emerge as SAAB B 18 in 1945) the Fokker G.1 was suddenly very interesting. Contacts with Fokker showed that there was no shortage of airframes but engines was in short supply, the only available engines were 45 Fokker D.XXI Mercury VIII engines ordered by Finland. Since the situation in Finland had changed the commander of the Finnish Air Force agreed to let Sweden take over the engines. Orders were placed for 18 (36 engines + spares) aircraft with an option on 77 more. These Aircraft was supposed to be named B 26 and used as bombers, but when the Do 215 contract was cancelled it was decided to use the first batch as reconnaissance planes under the designation S 13. Before any Fokkers could be delivered Germany invaded Holland and all available aircraft had to be used to defend Holland. S 13, 3rdDivision F3 Wing Sweden might have ordered the ”observer-tub” for its 12 reconnaissance aircraft, sources disagree, but it gives the Fokker a bit of umph! Aircaft in Swedish colors W26 Light Blue Gray and W 25 Olive Green, Eagle from the SAAB B 17´s of 3rd division, hence the yellow ribbon on the dispatch-tube. In the end it was the S 16 (Italian Caproni Ca. 313), B 3 (Junkers Ju 86) and T 2 (Heinkel He 115) that would fulfill the Swedish need for strategic reconnaissance untill the S 16 retired in 1945 and the B 3 in 1946-48. Would any of the S 10, s 11 or S 13 have been delivered to the Swedish Air Force they would have had to soldier on for a long time untill replaced by modern types. ← Semi unarmed and dangerous.